The Kardashian family is known for a lot of diverse things. From their beauty acumen to their style, the ladies slay, and it's apparently moving to the next generation. North West wearing Balenciaga boots is taking over Kim Kardashian's Instagram, and it's clear that fashion is running in this adorable kiddo's blood. Kim Kardashian posted an image to her Instagram on Monday that featured her adorable daughter North West, and as per usual, the eldest of the West children was looking adorable. The difference this time, though, was that she was casually lounging on the floor in her mom's gorgeous, silver metallic, thigh-high Balenciaga boots. Basically, North West isn't even in kindergarten yet, and she's rocking styles I could only hope to slay at 26. 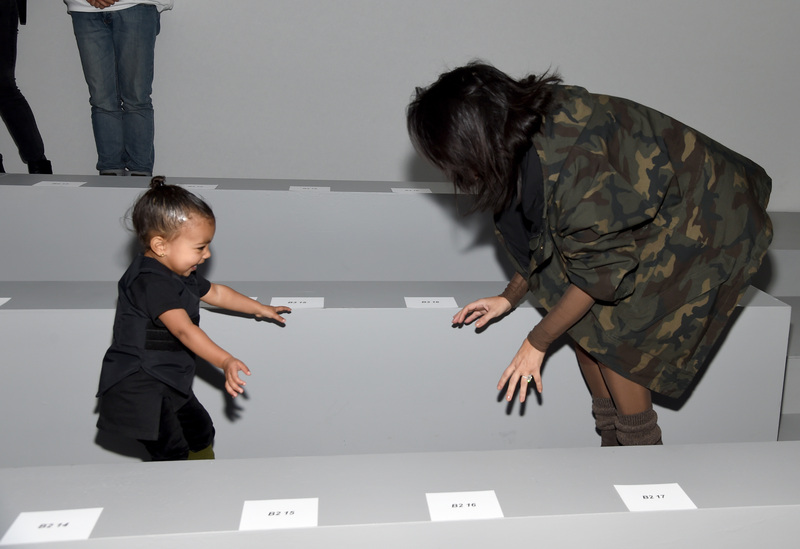 This isn't the first time that North West has made headlines for being adorable, though. West and her cousin Penelope Disick — daughter of West's aunt Kourtney Kardashian — can often be seen rocking matching ensembles in their moms' social media posts. From #twinning in ballerina uniforms to wearing flash tattoos, the pair seem both inseparable and perennially adorable. While North West may be known for her gig as Balmain designer Olivier Rousteing's muse for his Balmain Kids line, it appears as though the eldest West child may be moving on to Balenciaga now according to her mom's social media. Sure, West's appearance on her mom's Instagram is exciting, but it's her guest starring role on Kim Kardashian's Snapchat that's gotten people talking as of late. Now that Kim Kardashian posted a photo of North West in Balenciaga boots, though, my guess is that Kardashian's Instagram may return to being North West's best place to show off her burgeoning sense of fashion. The truth is, though, that no matter what social media channel we're able to see North West on, we're happy about it because this kid is a classic.